Pope Francis is demanding that the international community take "decisive measures" to resolve the causes of the mass exodus of Rohingya Muslim refugees from Myanmar, breaking his recent silence over what the U.N. has declared to be a textbook case of "ethnic cleansing." Arriving in Bangladesh on Thursday from Myanmar, Francis also said it was "imperative" for world governments to immediately help the Bangladeshi government provide for the refugees. In a speech before Bangladesh President President Abdul Hamid, government officials and ambassadors from around the world, Francis praised Bangladesh's sacrifice in welcoming in so many people. He didn't identify the Rohingya by name, ethnicity or faith, saying only "refugees from Rakhine state." But his words were sharp: "None of us can fail to be aware of the gravity of the situation." Bangladesh President Abdul Hamid has accused Myanmar's military of committing "ruthless atrocities" against Rohingya Muslims and is demanding international help in returning them safely to their homes and integrating them into Myanmar society. 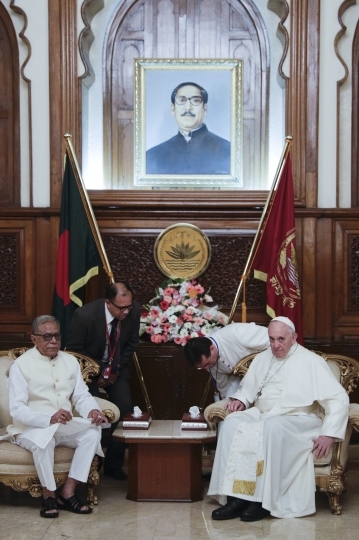 Hamid made the remarks Thursday when welcoming Pope Francis to the presidential palace at the start of a three-day trip to the Muslim-majority country. The president said thousands of Rohingya men, women and children had been brutally killed, their homes burned to ashes, and thousands of women raped. Hamid said Bangladesh has welcomed the refugees with open arms, but now there is a "shared responsibility" to safely return them home and help them integrate into the "social, economic and political life of Myanmar." 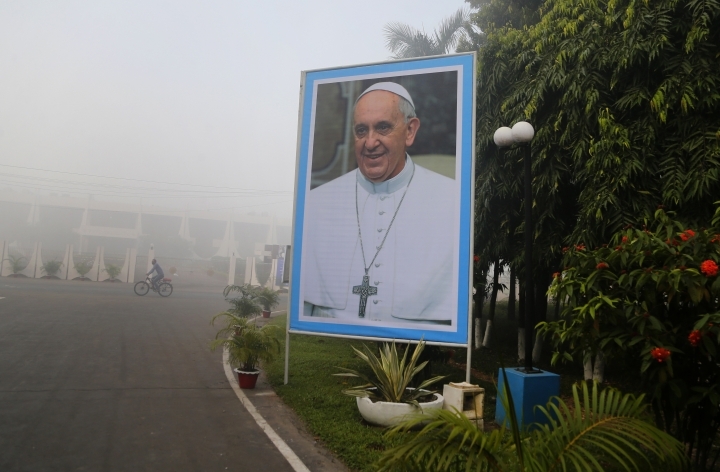 Francis arrived in Bangladesh after visiting Myanmar. 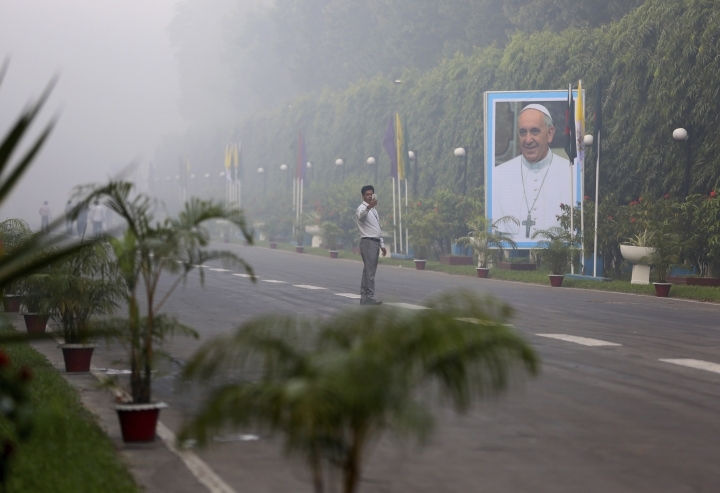 Pope Francis has arrived in Bangladesh for the second leg of his six-day trip to Asia amid tight airport security. Huge banners with pictures of the pope and Bangladeshi Prime Minister Sheikh Hasina have been put up around the city and St. Mary's Cathedral is decorated with lights in preparation for his three-day trip to the Muslim majority nation starting Thursday. A Christian priest went missing in northern Bangladesh on Tuesday, and his family reported they got calls demanding money. Police say they are looking for the man but would not confirm if it was a kidnapping. 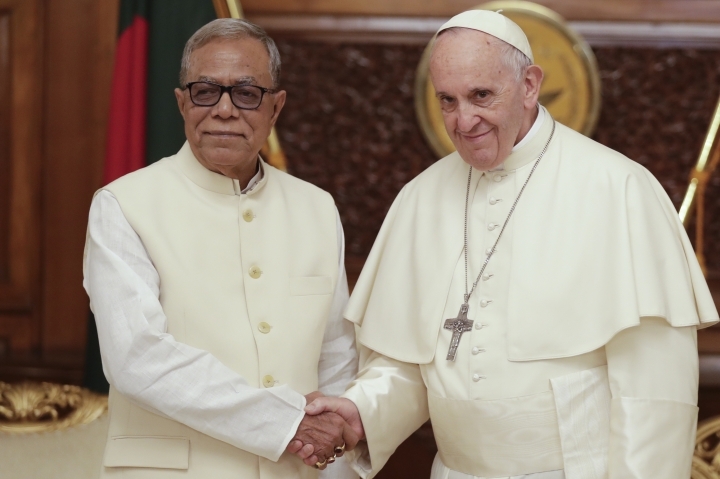 Francis arrived from Myanmar, where he refrained from speaking out about the Rohingya Muslim crisis out of diplomatic deference to his hosts, who consider the Rohingya as having illegally migrated from Bangladesh.